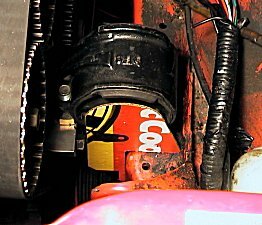 A brief tutorial on how I made the patterns for the engine mounts. 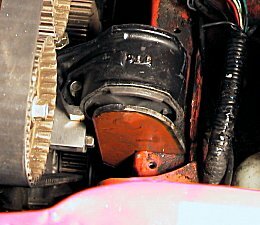 First of all, the engine needs to be in the proper location with respect to the half shafts and other reference points. 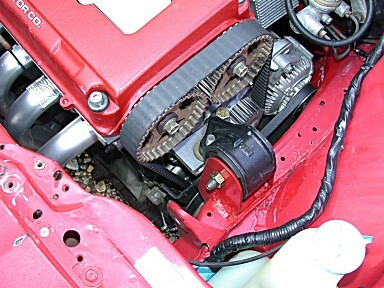 Once that is completed, I mounted the rubber mounts to the engine and cut a cardboard template to fit the frame and fill the space where the mount sits. Once the cardboard fits without interfering with anything, I need to know where the center hole of the motor mount will fall on the pattern. I applied a small amount of grease to the steel insert, re-fitted the cardboard taking care to apply pressure over the greased area, but being careful not to move the cardboard which would smear the transfer. 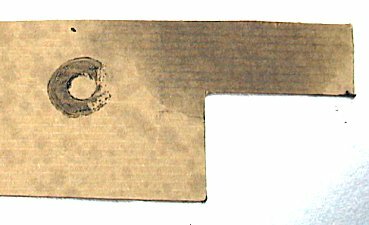 The area of the hole is neatly transferred to the cardboard. 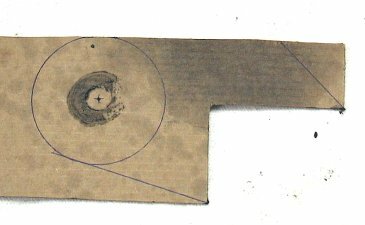 Once the area of the hole is known, a few lines can be added for trimming, so it doesn't look like too much of a hack job. The pattern is then cut out with scissors and test fitted back on the car. If all looks well, the pattern can be traced on to the plate steel. From there the bulk shape can be cut with plasma, gas torch, saw, grinder, or any other tool at hand. Once the steel is fitting good, and any adjustments have been made, I do the grease trick one more time. This time, the location of the center hole is transferred directly onto the steel. A center point is then established and the proper size hole can be drilled. The last step is to bolt up the new creation...looks like a good fit to me! 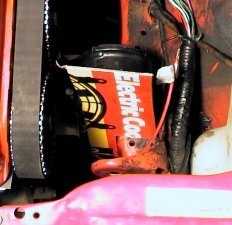 Once I am done with the transmission mount and the torque mount on the back of the engine, I will tack weld everything into place, drop the engine, and give everything a full force weld job. 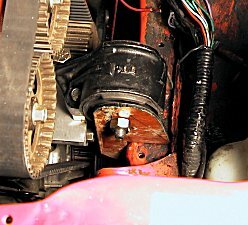 After that, the engine can be re-mounted in it's new home, and all the vitals can be hooked up. Here is a shot of the final product once welding and painting are complete. It's not the most glamorous, show quality mount around, but for 2 cents worth of scrap metal and an hour of time versus $650 bucks for off-the-shelf mounts, I can live with that!